Artist(s) : CARY J. & W.
Both globes had been part of the furniture at Plantation House since 1805. In July 1816, the Governor Sir Hudson Lowe had them sent to Longwood House where they were installed in the parlour also known as the billiard room. Virtually all the witnesses of the exile mentioned in their writings these “two globes, one celestial and the other terrestrial, about 15 to 16 inches in diameter, mounted on feet which bore compasses” as Ali described them. The room was large enough that Napoleon could deploy the many maps required for the writing of his memoirs, indeed it was temporarily designated as the “map room”. 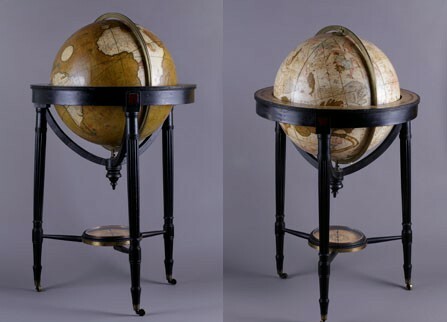 In 1818, however, the Emperor, who hardly consulted his maps any more, gave the globes to the Bertrand family for the education of their children. The terrestrial globe (on the left) bears an inscription in English: “Cary’s New Terrestrial Globe exhibiting the Tracks and Discoveries made by Captain Cook; also those of Captain Vancouver on the North West Coast of America; and M. de La Perouse, on the Coast of Tartary. Together with every other Improvement collected from various Navigators to the present time. London: sold by M. Berge Ramsden Piccadilly Jan. 1801”. Historians have long been convinced that Napoleon had scratched the location of the island on the map with his nail to delete it. But restoration carried out recently showed that this story was yet another legend. The damage was in fact the result of cracking of the thick varnish that covered the object. Another example of Cary’s new and improved celestial globe can be found in the collection of the National Library of Austrailia.